But slowly, I’m seeing signs everywhere that Spring is headed our way, and that fills me with delight. Our daylight hours are longer, the grass is becoming greener, birds are mating and telling the world about it, and spirits seem lighter. These will be yellow daffodils. I know because I’ve photographed them many times in previous years. And every year I tell myself they need to be replanted in a sunnier location. This is the Redbud tree I had planted just last year. Those tiny buds will become lavender-shaded flowers, which will give way to heart-shaped green leaves. The above is a type of yellow lily that returns every spring. 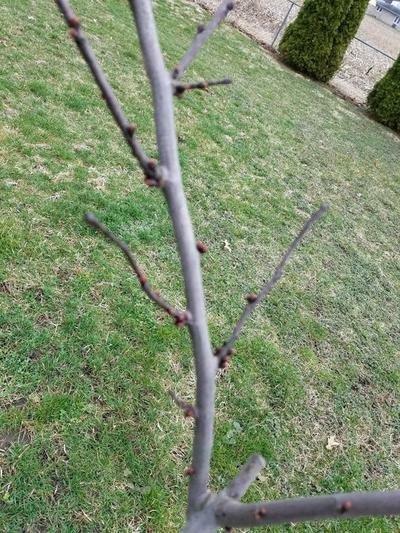 I just learned these should be deadheaded at the base after flowers bloom, rather than letting the stalks make seed pods. That way, you’ll get more blooms right up to a hard frost. Who knew? I’ve been wondering why they never seemed to bloom enough! 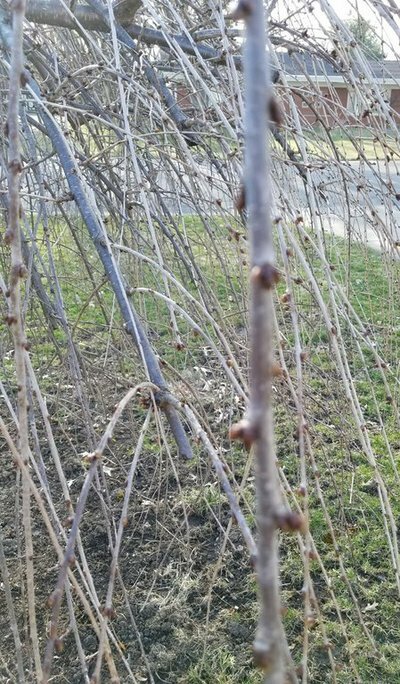 This is the cherry tree that looks so gorgeous with its pink and white blossoms in spring, yet turns into Cousin Itt after the blooms give way to leaves. I’ve been thinking of having it chopped down and replaced by something hardier (I don’t know what though). These are the Sedum a friend gave me last year after they’d bloomed. I had my doubts they would grow as she told me to stick the stalks into the ground and that would be enough. 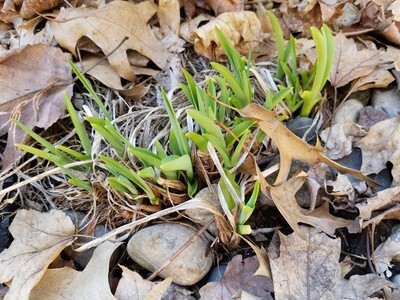 I think the rabbits ate all last year’s leaves and the birds chomped on the seeds so they were pretty sad-looking most of the winter; I can hardly wait to see what color the flowers will be! 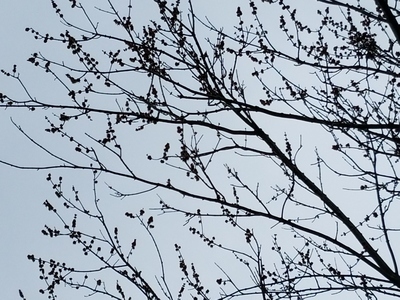 My neighbor’s Maple tree is chock-full of buds. I know she’s looking forward to once more having a leafy green source of shade for hot summer days. Now I can guess what you’re all thinking — yes, I’ll have to come back when spring really springs! 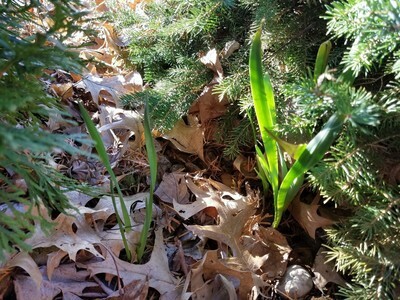 This entry was posted in Seasonal and tagged daffodils, early spring, lily, redbud, sedum. Bookmark the permalink. Those first signs of the season are so exciting! Even if things do wait until mid-May to really become Spring-ish, it is getting close. I can only imagine how ready you are. 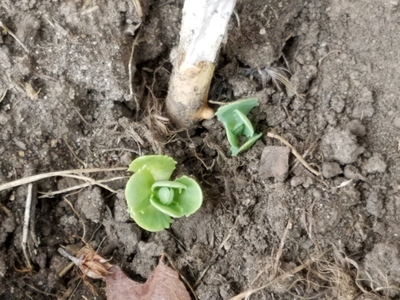 I’m anxious to see those sedum and lilies, especially. I don’t really know what sedum is. I’ll have to look it up It’s probably one of those things that’s all around me, and I just haven’t known about it. There’s so much to explore, and so little time! Linda, my guess is you’ve seen sedum but not known what it was (I was the same way!). There are lots of varieties and they seem to grow just about everywhere. My friend who gave them to me claims she can’t grow anything, yet hers were gorgeous, leading me to believe they must be easy-growers. You’re so right about there being much to explore and too little time to do so! Seventy degrees?? Oh, that sounds heavenly, Virginia! I’m longing for this winter to go back where it came from. It’s hung on far too long! At least we’ve had a couple of days that were sunny, so that’s a positive! Debbie, I thought the same thing yesterday while out taking a long walk. I smiled as I saw the magnolia trees and cherry blossoms starting to bloom in their beautiful shades of pink. The weather was perfect yesterday–it was on the cool side, but the sun was bright, and not a cloud in the sky! April here usually is like a yoyo, one day warm, the next day cold and rainy. Last year we even got snow mid-April. However, May usually kicks in the outstanding Spring weather. Great photos, my friend. Have a great rest of your week! Ron, they’ve been showing Washington’s cherry trees in full bloom on The Weather Channel, and they’re a sight to behold! One day, I’m going to have to see them in person, whether they make me sneeze or not. April yo-yos here as well and yes, I remember April ice storms. The good thing is that wintry weather doesn’t seem to hang around long when the spring months arrive. And Easter is later this year so maybe we won’t need coats and boots, ha! Thanks, Cindy. I sure hope we don’t get a “surprise” frost because that will nip the blooms for sure! Thanks for the spring walk. Yes you must come back when all these plants are in bloom. Glad you were able to join me, John. Yes, if the blooms show up the way they’re supposed to, I’ll be glad to photograph them! Ah, nice to see some signs of spring! We had a spring-y week last week, but this week’s gone back to winter – it’s literally freezing tonight. I do prefer cold weather, but even I am beginning to long for a little bit of sunshine! I’m right there with you and the sunshine, FF. I prefer warmer weather, but if it’s got to be cold, then at least give me the sun! That dreariness wears on a person. Yes, especially this time of year discretion is required around geese. I’ve heard they can be mean even if they’re not mating. Their size alone is intimidating! Oops, commented on wrong post!